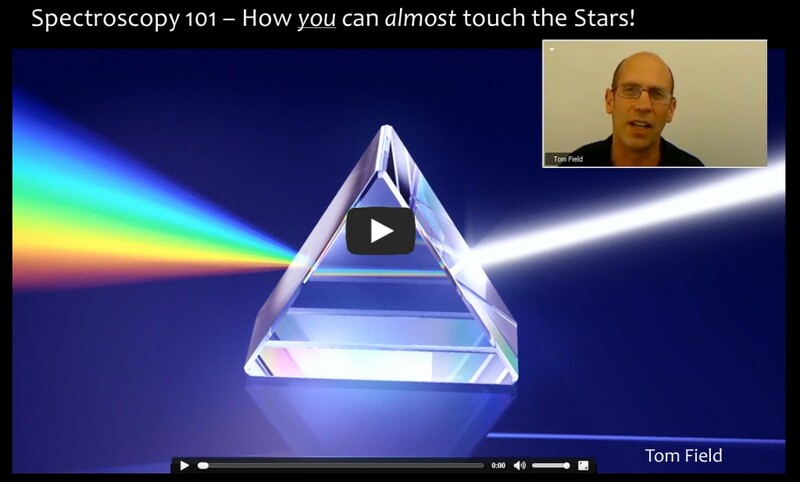 What to know more about spectroscopy? Invite Tom Field, author of the RSpec real-time spectroscopy software, to speak to your club or high school class. 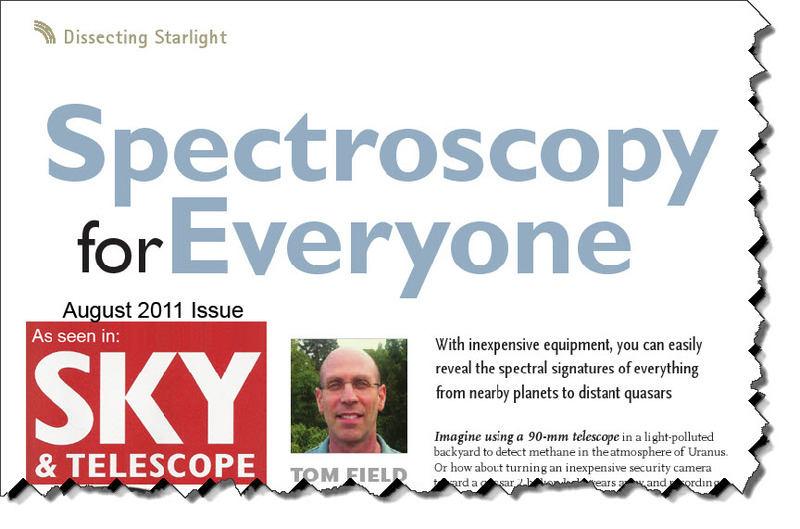 Tom is a contributing editor at Sky & Telescope Magazine. He’ll speak for free to your group via a live video webinar. Tom says that most amateurs still think that spectroscopy requires prohibitively expensive equipment, a mountain-top observatory, and an advanced degree in astrophysics. That might have been true many years ago. But, the tools available these days make it easy for almost anyone to capture astonishing spectra. There are teenagers as well as 80 year olds who are doing spectroscopy. Isn’t it time for you to unleash your “inner scientist”? For examples of the exciting science that can be done with a small telescope, see our samples page: www.rspec-astro.com/sample-projects. Even if you’re half way around the world, if your club or school has internet access in its meeting room, Tom can appear with live video using professional, webinar software. Tom uses web-seminar software called Cisco WebEx. It’s like Skype, but even more powerful because it’s designed to meet the needs of businesses. These presentations are totally free of charge. These are not software sales demonstrations. The talks are aimed at the rank and file amateur astronomer or even high school classroom. Tom’s presentation focuses on the history of spectroscopy, the science, exciting sample results, and (when speaking to clubs) how-to-get-started. His talks are followed by a live Q&A session. Email Tom (link) to schedule your presentation or to set up a short sample meeting so you can see this remarkable technology in action. Web Presentations? Are they good enough for your club? Over the past four years, Tom has spoken to more than 200 clubs, conferences, and star parties, both in-person and via the web. See these testimonials on the CloudyNights forum: www.cloudynights.com. Below is a testimonial we received from a large club in Maryland. Below is an email from a board member at the Riverside Astronomical Society (link). This highly respected club organizes RTMC and PATS. Thanks very much for doing your webinar remote presentation to Amateur Telescope Makers of Boston tonight! I got many positive comments after the meeting – members were really engaged and attentive during your presentation. 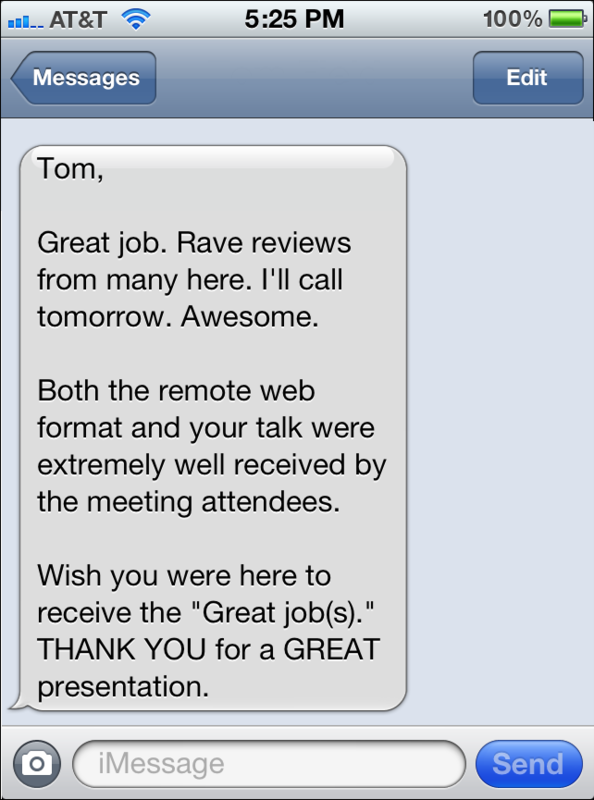 To calibrate these positive comments, we get very high quality professional speakers for many meetings. With your high energy level and humorous banter from time to time, no one was in danger going to sleep during your talk. I wish to thank you for a wonderful experience with the on-line presentation. It exceeded my wildest expectations, and everyone was very impressed with the quality of both the presentation as well as the flow of data. It was truly as if you were right there with us. The video was smooth and audio was very good. No lags or dips that we could make out. Will Tom’s talk be any good? As a Contributing Editor at Sky & Telescope Magazine, Tom is well-known in the astronomical community for his lively and interesting presentations. With contagious enthusiasm, he clearly explains his topic, and shows great example spectra of objects that are familiar to his audience. Tom has been a speaker at a large number of conferences, including the Advanced Imaging Conference, the Winter Star Party, NEAF, NEAIC, PATS, and OPT’s SCAE. Tom has also given presentations over the web to many, many clubs, including the Boeing Employees Astronomical Society, Austin Astronomical Society, RTMC, Amateur Telescope Makers of Boston, and clubs in Australia, South Africa, the UK, India, and others. He would be happy to put you in contact with board members of these clubs if you would like to hear their opinions first-hand. Tom is listed as a lecturer on the Astronomy Outreach Network: link. Copyright ©2010-2019 Field Tested Systems, LLC.